Mystery is washing ashore along beaches in the South Bay. An Alviso woman strolling along the water Tuesday spotted at least 12 dead bat rays floating motionless. That number has since increased to 15 dead rays found in four different ponds at the Don Edwards San Francisco Bay National Wildlife Refuge, according to Santa Clara County Park Ranger Brian Christensen. The U.S. Fish and Wildlife Department says the bat rays are being inadvertently trapped as officials flood the salt ponds with bay water. The process gradually encourages wildlife that thrive in habitats less salty, but a spokesman for the federal agency says bat rays and other fish sometimes get trapped, unable to handle initial salt levels and perhaps depleted oxygen levels. “This is not an alarming development,” said Fish and Wildlife spokesman Doug Cordell. "If the occurrence was larger, we might change our management practice, but it’s not cause for alarm." 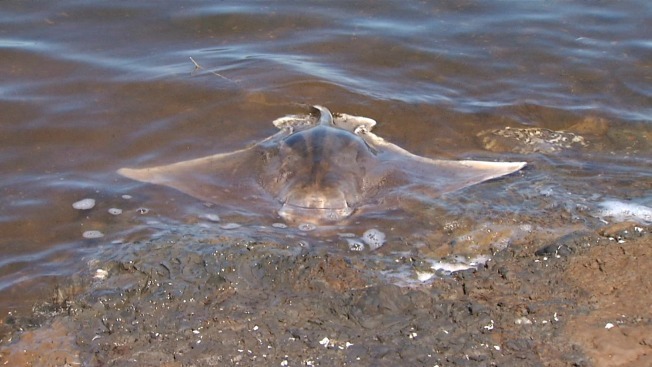 According to marine experts, periodic spikes in bat ray and shark deaths have been reported in the San Francisco Bay for decades, but this number for bat ray deaths is large.